Angela Chao graduated from Harvard College with a degree in Economics in 1995. She went on to join the mergers and acquisitions team at Smith Barney investment bank, now known as Morgan Stanley Smith Barney. Chao went on to further her studies at Harvard Business School in 2001, where she received her Master of Business Administration (MBA) degree. During her studies, she wrote a case study titled ‘Ocean Carriers’, which has since become a part of the first-year required curriculum taught at Harvard Business School. Shortly after completing her MBA studies, Angela joined Foremost Group as Assistant Vice President. Since 2009, she has been the company’s Deputy Chairman. 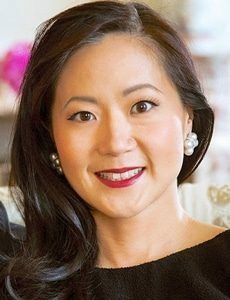 She and the Chao family have been a subject of the public’s interest for quite some time, in light of their extensive philanthropic work and history of building a successful international shipping business from scratch as Chinese immigrants to the U.S.
Angela Chao has also made a name for herself in the public speaking world. She travels the globe to present at events and give lectures, and this work has been recognized internationally, as has the role she plays in the advancement of women in the business sector. Angela Chao and her family have been involved in an extensive range of philanthropic endeavors for many years. The Chao Family Foundations were established with the vision of supporting young people to access education and academia as a route into a successful life, and also to promote US-Chinese cultural exchanges. Operating under this umbrella, the Foremost Foundation, established by Angela’s parents Dr. James S.C. Chao and Mrs Ruth Mulan Chu Chao, operates with the belief that students deserve an education regardless of their background. In light of her philanthropic family heritage, Angela has made it known that she will continue in her parents’ footsteps and continue her parents’ legacy and spirit. She is an active philanthropist who has taken a firm stance on the importance of education – as part of the values her parents instilled in her from a young age. In October 2012 Angela and the Foundation donated a generous sum of money to Harvard University, from which her and three of her sisters graduated, for the construction of the Ruth Mulan Chu Chao Center. The building will sit at the center of campus and is designed to serve Harvard Business School’s Executive Education program, providing room for students to share thoughts and better educate themselves. It is the first building on campus to be named after a woman or a person of Chinese descent. Angela Chao also plays an active role in delivering the Ruth Mulan Chu and James Si-Cheng Chao Family Fellowship at Harvard Business School and at Harvard College. These scholarship programs grant funding to prospective students without the financial means to otherwise afford a higher-level education, allowing them to achieve their goals and fulfil their potential. Beyond this, Chao serves on the boards of the Metropolitan Opera, Massachusetts Maritime Academy’s International Maritime Business Department Advisory Board, as well as the Chairman’s Council of the Met Museum of Art., among others. She previously served on boards of Lincoln Center Global Advisory and the Museum of Modern Art PS1. She is an avid supporter of the arts and opera.